It was my first time to experience swimming at Splash Island Spa and Resort last April 15, 2011 with my family. My brother reserved the ticket online through their promo at metrodeal. The price of that promo is only Php400 per head with free buffet lunch. We arrived there at exactly 8 AM. My brother and elder sister rushed to the entrance gate and they found a long line for the verification of the reservation. My brother decided to go immediately inside the resort to rent for a cabana because it says the cottages are on a first come first serve basis. My sister fetched us at the parking area and we waited for my brother’s return at the entrance gate because he holds the tickets. When my brother returned, he gave us the tickets and he said that he already reserved a cabana. We reached the cabana that my brother reserved but we were surprise that somebody claimed that area. My brother complaint to the management and talk to the manager. We were able to get another cabana and we told ourselves not to think that bad incident because we are there to enjoy. 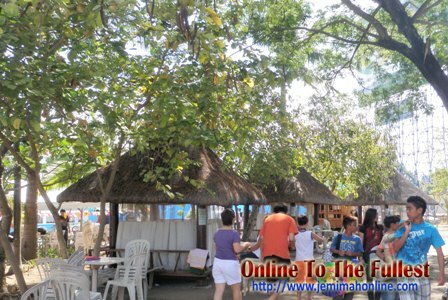 Anyway, if you are planning to go to splash island in Laguna for a family outing it would be best to arrive there very early like 7 AM so you can choose a good cottage. It is Friday but there are many people.Â For singles or barkada outing, you may occupy the free tent and tables then just rent a locker for only Php100. The rates of the cabana depends on the types ; small cabana- Php500, cabana with lock – Php800, cabana with aircon and lock – Php1, 000, Cabana with sala set, private bathroom & bedroom – Php 5,000. For the updated price rate, please visit their websiteÂ at http://splashisland.net or contact them. Splash Island truly has a spacious great swimming pools and other resort facilities but they only lack management in their cabana or cottages. It can really accommodate thousands of people. Their swimming pools, shower rooms, rest rooms and cabanas are clean and well-maintained. The problem that I just observed inside was regarding their metrodeal promo with free Mongolian buffet that they had during that time. I think they are not prepared for the volume of people that bought the promo. It took us one and a half hour to take the free Mongolian buffet food. Some of us were starving already, we also bought some foods there instead of waiting the free buffet lunch. There are many food stalls inside the Splash Island so you can choose what and where to buy. I think the price is just right. One thing that I would like to suggest to the Splash Island management and that is the process of the reservation of cabana. It is very uncomfortable for the customer especially if they have kids or oldies to search the whole resort just to find a cabana for reservation. A great reservation process like allowing the customer to reserve the cabana ahead of day or time will result in good management. I hope that Splash Island’s Management will look unto this. Overall, Splash Island is a great place for people really looking for something different in swimming pool resorts. Everybody will truly enjoyÂ whether you are a parent, grandparent, single, teens, kids or even toddlers. I will definitely go back here for a fun pleasure with my close family or friends.